Spondylolisthesis or a slipped disc is a condition that occurs when a bone in the lower spine shifts out of position and is displaced forward over the bone beneath it. The condition may develop from spondylolysis, which is a stress fracture in one of the stacked bones (called vertebrae) that make up the spinal column. Spondylolisthesis occurs when spondylolysis weakens the bone so much that it starts shifting out of position in the spinal column. In addition with arthritis, the facet joints become worn out and are no longer able to stabilize the vertebra (degenerative spondylolisthesis). If the bone shifts out of position too much, it may begin to press on surrounding nerves. Nerve damage may result and can cause shooting pain down the legs. What Are the Symptoms of Spondylolisthesis/Slipped Disc? Spondylolisthesis can have a variety of symptoms. Some people may not experience any symptoms at all. For others, symptoms can be mild to severe and include lower back pain, tightness in the hamstring muscle, stiffness, tenderness surrounding the area of the slipped disc, and pain in the thighs and buttocks. Spondylolisthesis may cause lordosis (called “swayback”) or kyphosis (called “roundback”) as the lower spine displaces from the upper spine. Other patients may develop symptoms from compression of the nerves. What Are the Causes of Spondylolisthesis/Slipped Disc? Congenital spondylolisthesis: is present at birth and is caused by abnormal bone formation, putting the vertebrae at risk for slipping. Isthmic spondylolisthesis: develops from spondylolysis, which is a stress fracture in one of the vertebrae bones. In some cases, the fracture is so severe that it causes the bone to slip out of its position. Pathological spondylolisthesis: a disease, tumor or infection weakens the spine, causing spondylolisthesis to form. Traumatic spondylolisthesis: some form of trauma or injury causes the spine to fracture and move out of its position. Post-surgical spondylolisthesis: occurs when spinal surgery causes or worsens bone slippage. In children, the condition most commonly affects the fifth bone in the lower spine and the first bone in the pelvic area. When spondylolisthesis is present in children, it is usually caused by a birth defect (congenital spondylolisthesis) or a repetitive injury or stress fracture (isthmic spondylolisthesis). In sports that place significant stress on the lower back, such as gymnastics, football and weightlifting, those bones are susceptible to stress fractures on one or both sides of the vertebra. 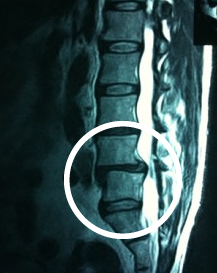 In adults, the condition is most often caused by spinal degeneration (wear and tear) (degenerative spondylolisthesis). What Are the Treatments for Spondylolisthesis/Slipped Disc? Treatments for spondylolisthesis vary depending on the patient and severity of the condition. Physicians at Midwest Orthopaedics at Rush usually first recommend non-surgical treatments such as stretching, modifying activity, abstaining from sports, taking anti-inflammatory medication to reduce pain, wearing a back brace, or undergoing physical therapy.